For true drivers, this car needs no introduction. 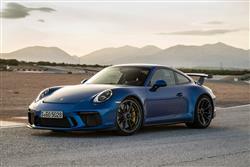 Here's Porsche's latest 911 GT3. Jonathan Crouch drives it. 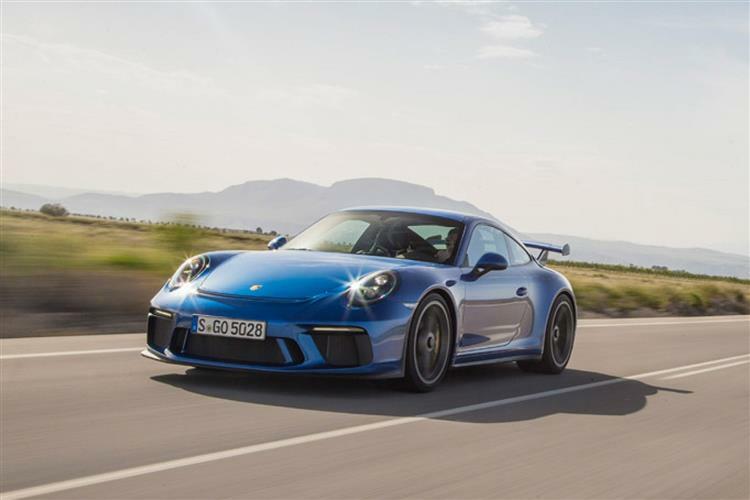 If the 911 is Porsche's legendary model, then the GT3 is the best of the best. This latest model offers manual or PDK auto transmission and has 500hp at its disposal from a 4.0-litre flat six engine. Could this be is the most capable GT3 ever? 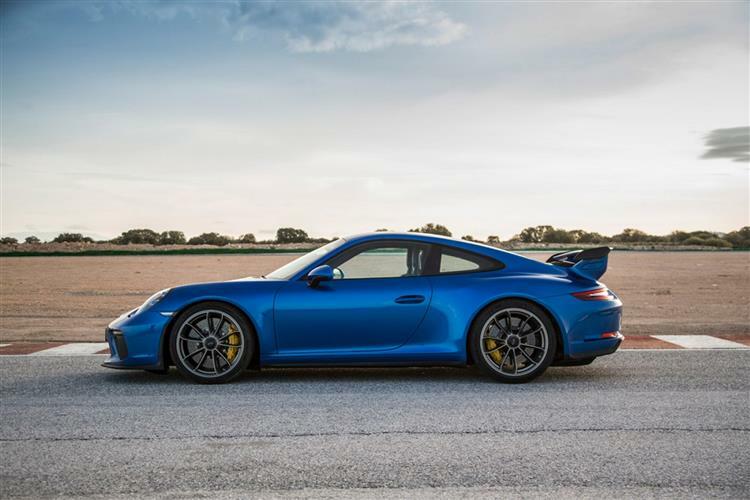 The Porsche 911 GT3 is to many serious drivers a deity amongst sports cars. It's the car they'd have and never sell, the most capable combined road and track car that's ever been offered for sale. The five versions of it that have gone before this current model all had engines derived from the GT1 racing block, all had amazingly communicative hydraulic power steering and they were all fantastic. Whether you chose the original 1999 model year '996' Gen(eration) 1, 2003's '996' Gen 2, the '997' Gen 1 from 2007, the 3.8-litre '997' Gen 2 from 2009 or the more recent 462hp auto-only model from 2013, these constituent parts were considered aspects of the GT3's DNA. Pure, iconic, irreplaceable. This improved model gets a fresh 4.0-litre engine and a manual gearshift option once again. It promises much. It's customary at this point to talk about how quickly the GT3 laps the Nurburgring at the hands of Walter Rohrl, but how relevant is that to us mere mortals? Not much. We already know it's ludicrously rapid. With 500hp developed at 8,250rpm, it was always going to be thus. You get a naturally aspirated 4.0-litre flat-six engine that features developments including friction-reducing plasma-based cylinder liners, a stiffer crankcase, redesigned cam followers within the rocker bearings and a clever scavenging system for the dry sump that is claimed to reduce oil recirculation by more than 40%. The engine features dynamic mounts that stiffen as revs rise to help dampen load change and revs right up to 9000rpm before the ignition cut-out spoils your fun. 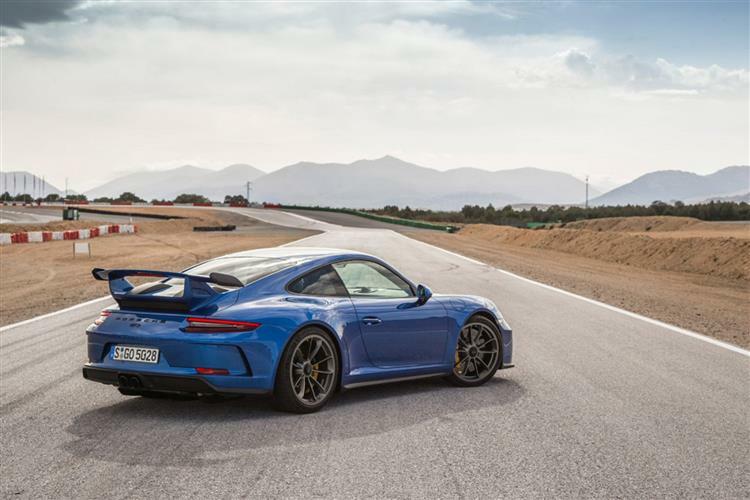 With all that rear-wheel drive traction and a built in launch control mode enabled, Porsche claims this powerplant propells the manual GT3 from 0-62mph in 3.4sec, which is 0.5sec slower than it quotes for the dual-clutch model, on the way to 124mph in 11.4sec. Maximum speed is 198mph. If that's not fast enough, there's a 521hp GT3 RS variant, which reduces the sprint figure to 3.2s. 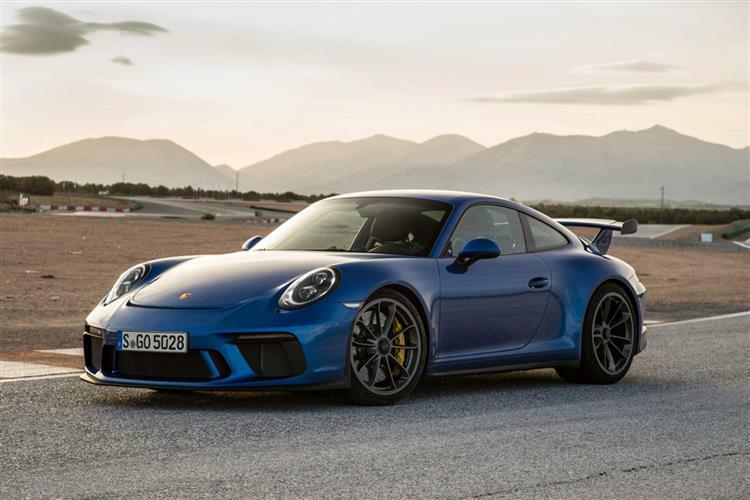 Porsche has tried to make the GT3 easier to live with as a road car, hence its adjustable dampers, which can be set to either Comfort or Sport mode, and which have been modified to provide a wider operating range. So what's changed design-wise? Well, there's a re-styled front bumper that's around a kilogram lighter than the previous one. Porsche are also keen to highlight the subtle front suspension changes, supposed to improve steering response and high-speed stability. The wheels, and the brakes inside them, are the same as before, which means that you can have optional carbon-ceramic discs - if you can afford around £6,500 more. 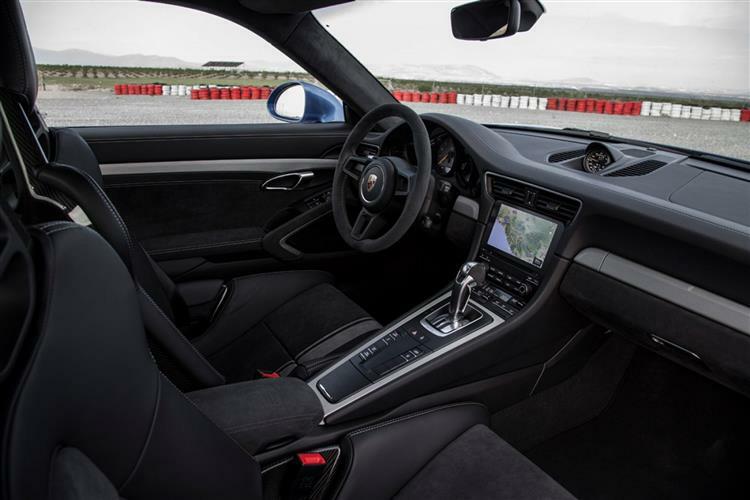 Inside, the changes over the previous version are even more subtle, the main change being the adoption of the latest Porsche's infotainment system. 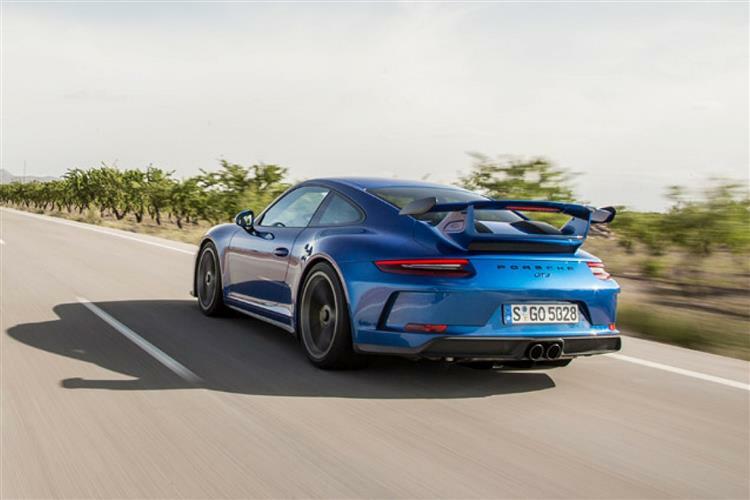 Apparently there's less sound-proofing because there have been a few kilograms added to the body weight courstey of some extra plates to increase crash stiffness: Porsche doesn't want that to add to the weight of the previous GT3 model - 1,430kgs, in case you're interested. Prices start at around £112,000 for the 500hp version. The 521hp GT3 RS costs aropund £141,500. The normal equipment list that applies to most cars in this price bracket seems rather gauche when applied to a GT3. You pay for the engine, the chassis technology and the barn-door over-engineering that allows these cars to stay out lapping when something like a Nissan GT-R has cooked its brakes, boiled its transmission fluid and worn its tyres to the canvas. 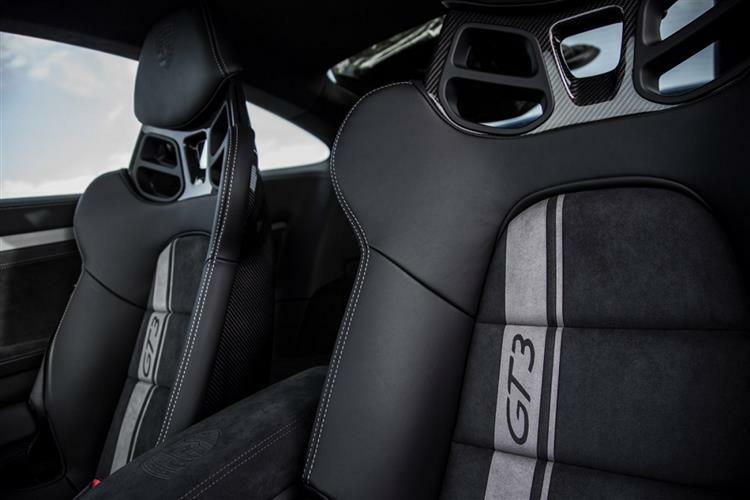 Nevertheless, if you're interested, you do get sports seats finished in Alcantara and leatherette, plus standard equipment that includes automatic climate control, Bi-Xenon headlights, a universal audio interface offering MP3 connectivity and a three year warranty. Key options include Porsche Ceramic Composite Brakes (PCCB) at just over £6,000, LED headlights incorporating Porsche Dynamic Light System and a front axle lifting system which is well worth choosing if you have to negotiate drop kerbs, speed humps or British B-roads. It'll set you back just over £2,000. The popular Club Sport package, comprising a half roll-cage, multi-point harness seat belts, fire extinguisher and battery cut-out switch, also remains a mainstay of the options list. Some things to consider here. You're driving a £112,000 car that in five years will probably be worth somewhere in the region of £65,000. Drive it as Preuninger and his team envisaged and you're not going to come anywhere near the 22.2mpg combined economy figure or 288g/km emissions claim. In fact, Porsche should monitor owners and invoke a compulsory buy back scheme if average economy tops 20mpg. But seriously, this is never going to be a cheap car to run. A couple of track days will see off a set of the gumball 19-inch Pilot Sport tyres and they're 20-inch items at each end. Insurance is a top of the shop Group 50 with some insurers deviously looking to load policies still further for cars fitted with roll cages. So that thing about 911s being affordable to run once you've got over the shock of the initial purchase price? It doesn't necessarily apply here. The standard 911 Carrera is a car that seems initially a little aloof but comes alive when you drive it hard. You can do nothing but drive hard in a GT3. It's what it's for. Turn all of the 911's responses up several notches and this is what you arrive at; everything Porsche knows about the car distilled in essence and lovingly prepared. Progress can often be uncomfortable, but it's usually only an issue of acclimatisation. I'm already looking forward to getting over-familiar with the GT3.